As a faithful book nerd, I pick up books wherever I can find them, and the thrill of the hunt is strongest at spots like dollar stores, library sales and used books shops. I found THE QUEEN OF WHALE CAY: THE ECCENTRIC STORY OF JOE CARSTAIRS, FASTEST WOMAN ON WATER by Kate Summerscale and it did not disappoint. Yes, that's a doll on her shoulder in the cover photo; more on that in a minute. Marion Carstairs was born at the turn of the 20th century. Her father was out of the picture, and her relationship with her mother was dysfunctional at best. She was a fast-moving person of little inner reflection, a woman who wanted to live as a man. 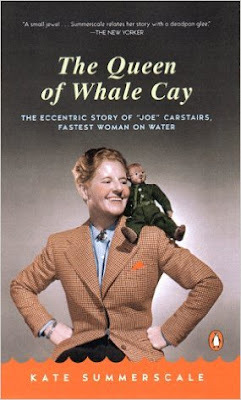 Between her ambition and her family's money, she charged ahead with many jaw-dropping accomplishments considering the period: she was a driver during World War I, opening a garage with her war buddies afterward; she raced custom-made speedboats alongside men in world championships, and even bought and ran an entire island community in the Caribbean. She also renamed herself Joe, dressed as a man, smoked cigars, had tattoos, and was a lesbian with a voracious sexual appetite: the book estimates she had more than 120 girlfriends during her life, including Marlene Dietrich and Tallulah Bankhead. She kept photos of most of them, souvenirs of the roguish lifestyle she fashioned for herself. During and immediately after World War I, gender roles were loosened for women due to the shortage of young men. This was the perfect time for Joe, where she could feel free to act as she wanted. That wouldn't last, but Joe would; she never changed her hard-driving ways even though society eyed her with suspicion. In order to deal with her emotions and family dysfunction, she learned to connect with inanimate objects rather than people. The doll, Lord Tod, was a gift from a lover and Joe funneled part of her soul into him, making him part of her ultimate wish to be a man. The doll was the one person she stayed with throughout her life, until her death at age 93. The book was written in the late 1990s, and it presents Carstairs as eccentric. This may well be, but reading it in 2016 presents the question of Joe's gender disparity. She lived hard and fast, reveling in eternal boyhood, splintering her mind so she could cope. It's a fascinating and often entertaining read that stays with you long after the book is closed.